Fancy a fright this Saturday night at the movies? Well, the frightfully funny ‘Young Frankenstein’ is showing at Downhill Demesne this Saturday, September 23 at 8pm. 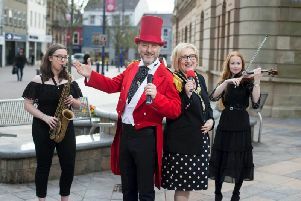 The outdoor film event is being organised as part of Belfast Film Festival. Like most of his other films, Young Frankenstein is director Mel Brooks’s loving homage of a classic story. In this satire of Mary Shelley’s Frankenstein, Gene Wilder stars as the mad scientist who reanimates a dead man into a monster. A Brooks regular, Wilder is comedic gold, and the rest of the cast is perfect as well: Marty Feldman is hunchbacked assistant Igor, Madeline Khan plays Elizabeth, Cloris Leachman is Frau Blucher, and Peter Boyle plays the monster. Before the main feature, you can also watch The Fall of the House of Usher (1928), lasting 13 mins. In a decaying castle surrounded by a dank, mirrored lake live the morbidly nervous Roderick Usher and his sickly twin sister, Madeline. Their tale is told and dimly comprehended by the unnamed narrator, a boyhood friend whom Roderick has summoned. Tickets for this fantastic event are priced at £7. Log onto Belfast Film Festival’s website for booking.